After knowing about this for almost three months, I can finally go public about the rumors that have been flying among ICS customers for quite a while: IBM is giving up on IBM Watson Workspace. Back in 2016, Project Toscana was announced as the next big thing from IBM Collaboration Solutions during the IBM Connect conference. It later changed its name to IBM Watson Workspace. According to IBM, it would introduce a revolutionary way of collaborating. The Slack like client would be combined with the AI technology found in IBM Watson. Just like in Slack you had your own chat rooms (spaces) where you could chat, share links, upload media files etc. After a while they also introduced video conferencing as well. This was managed by integrating the Zoom conferencing tool into the WW client. 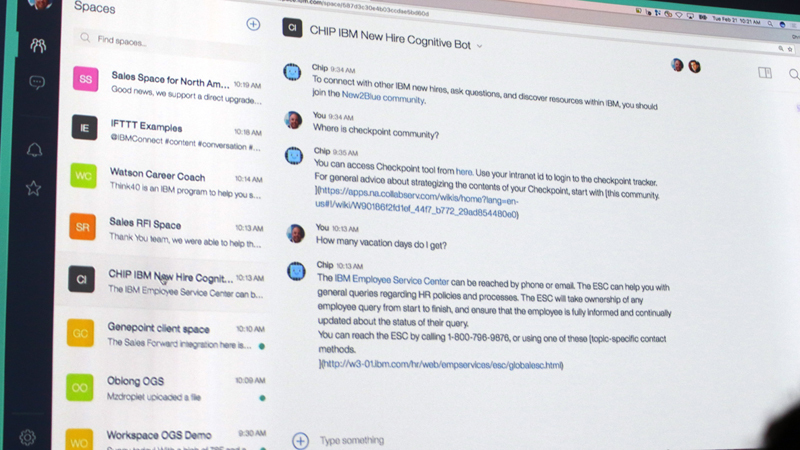 IBM’s goal was that the AI technology in Watson would make it easy for you to catch up on what had been going on in the chatrooms while you were away. The Watson technology would analyse your chat behavior, and when you returned after being away, you could use a function called Moments, which would do a summary on what it deemed important to you from the conversations. This is a function I feel worked really well, and it’s one I really miss in Slack. Watson Workspace was free in it’s basic version, but via the plus (paid) service, you could use WW as a development platform where you could set up chat bots, AI assistants (that could answer questions or guide you) and integration with other platforms (like IBM Connections, Sharepoint etc). There was also an integration where you could chat with people in WW via Slack, and vice versa. Unfortunately IBM dropped the ball on this one. The marketing has been non existent, and compared to Teams and Slack, there have been way too few possibilities for integration with other systems, platforms and solutions. The followup on the product has also been sorely lacking. There were a lot of possibilities that were promised that never happened, and the huge integration with Watson was never as good as promised. It’s the same old story. IBM has a product that is similar to what a lot of other vendors have, but fail to deliver that special something that would make people do the switch. Or maybe they do have that something special, but they fail to market it properly. There has been a lot of frustration among IBM business partners because of the decision to shut WW down. Not only weren’t business partners forbidden from telling their customers for almost three months. A lot of time, resources and money had been spent by many partners on making solutions using WW that now is literally wasted. This makes trusting IBM’s commitment to their own products very hard, and that’s a trust IBM can’t afford to lose in the situation they are in these days. I was an early adopter of WW, and I used it every day. I saw the potential in the product, I did presentations of it, I did webinars where I demoed it, and I promoted it just like I promote Notes/Domino, Connections and so on. But I have to be honest: I feared this would be the result. It’s not always fun to be right. Tuesday 15 Jan 2019, IBM will formally announce the End of Marketing for all Watson Workspace offerings and we anticipate ending the Watson Workspace service on 2/28/19. This includes Watson Workspace Essentials, Plus, and the free offering. It is our intent to ensure that you have a clear understanding of your options regarding the closure of Watson Workspace. While there is no question that Watson Workspace is innovative and agile, it hasn’t resonated with clients or obtained the traction in the marketplace necessary for IBM to continue forward with the service. Despite our best efforts and enthusiasm for these offerings, our decision to withdraw them aligns to IBM’s investment strategy, focused on delivering solutions that deliver measurable value to our customers and business partners. IBM has stopped accepting new orders for Watson Workspace products, and we will not be adding any new features to the offerings. We have been working with our licensed customers and business partners to provide options for handling subscriptions and contracts once the end of service announcement is published to provide a smooth transition. Starting tomorrow there will be a banner placed into the UI of Watson Workspace informing users of the timeline for moving off the service. Mobile customers may find details in the release notes of the mobile app. We will also provide access to a tool that will allow you to download and save your conversations and content from Watson Workspace. Please plan accordingly to capture any content you’d like to retain as we work to sunset the service. This option will only be available for a limited time. Thank you for your support of Watson Workspace and IBM Collaboration Solutions. Please find additional details and answers to commonly asked questions in the FAQ that will be posted in the Watson Workspace banner tomorrow. haven’t seen it at my workspace so marketing was not that big. unfinished products, IBM’s core business it seems to be.